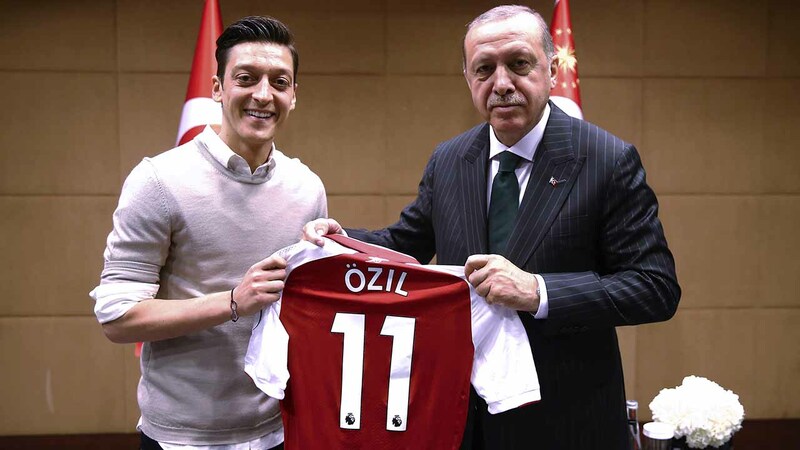 (FILES) This handout picture taken and released on May 13, 2018 and released on May 14, 2018 by the Turkish Presidential Press office shows Turkish President Recep Tayyip Erdogan (R) posing for a photo with German footballer of Turkish origin Mesut Ozil (L) in London. Footballer Mesut Ozil said Sunday he had no regrets about his controversial photograph with Turkish President Recep Tayyip Erdogan that sparked questions about his loyalty to Germany’s national squad ahead of the World Cup. Breaking his silence over the snapshot that caused outrage during the tournament, the Arsenal midfielder said in a statement on Twitter that he was true to both his Turkish and German origins and insisted he did not intend to make a political statement. Ozil, 29, said he had first met Erdogan in 2010 after the president and German Chancellor Angela Merkel watched a Germany-Turkey match together in Berlin. Ozil and Gundogan, who both have Turkish roots, were booed by German fans in pre-World Cup friendlies after posing with Erdogan in May in London. Manchester City midfielder Gundogan presented him with a signed club shirt on which he had written “to my president”. After the tournament, Ozil came in for stinging criticism in Germany for the side’s shock first-round defeat at the World Cup. Meanwhile, former captain Lothar Matthaeus accused Ozil of no longer looking comfortable in the Germany shirt. He angrily denounced the broadside by Matthaeus, who he noted “met with another world leader a few days back and received almost no media criticism” in an apparent reference to an appearance with Russian President Vladimir Putin. Ozil also railed against an unnamed sponsor which he said removed him from promotional videos for the World Cup after the pictures with Erdogan emerged.